When I re-painted my home office shortly after, I used the small message as my centerpiece. I chose paint that matched the green, and pumped up the yellow to a brilliant lemon for the opposite walls. My entire room is filled with art, most of it by or from friends. But this little green and yellow missive now hangs directly in front of me when I sit down at my desk to write. I think of it as a Purple Heart, a badge of honor. For many, many years I struggled and fought, questioned and doubted, stubbornly resisted. I said, over and over again, “I am not that!” I wasn’t sure exactly who I was, or where I was headed, let alone how to get there. But I knew that someone else’s answer wouldn’t work. I was convinced that even my family’s best wishes for me, though much appreciated for their intent, were off the mark. Stumbling through many dark years, becoming a friend with despair, making mistakes again and again…still, I pushed on. Some small voice in my head said, “You are enough.” But I felt so flawed, and so out of step, and so lost. And then my Zen teachers told me: “The goal of practice is not to become a better person; it is to become more fully yourself.” To become who you really are. When I received that little painting from my sister, I knew I had finally been seen. And being seen by someone else helped me to see myself. 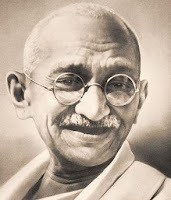 Ghandi – just saying the name conjures up an awesome energy, a reverence, a worshipful adoration. When people are asked, “What if you could have dinner with five people, living or dead, who would you choose?” the name “Ghandi” frequently makes that top five list. And yet – I read something today about the saint-like Ghandi that taught me a lesson not of what to do, but of what to avoid. I am reading the book The Elephant and the Dragon: The Rise of India and China by Forbes magazine Asia editor Robyn Meredith. In it, she chronicles Ghandi’s legacy in India. Much of that inheritance, we know, was a great gift. He embodied the idea of nonviolent protest, setting an example that would transform human and civil rights movements in the coming years. And he gave India a sense of identity separate from British colonial rule. But did you know that he also was completely against modern medicine, because of its ties to the Western world? When his own wife lay dying from bronchitis, doctors flew in penicillin to save her life. Ghandi believed that even the use of a needle contradicted his philosophy of nonviolence. So he turned the medicine away, and sat at his wife’s bedside, holding her hand until she died, of a completely curable disease. Meredith also states that Ghandi professed the only acceptable form of birth control was abstinence. He remained sexually abstinent for the last 42 years of his life. Wanting to follow his example, his fellow country men and women shunned all methods of contraception. But, being less saintly than their guru, they failed to live up to complete abstinence, of course, leading eventually to the population explosion in India. There is absolutely nothing wrong with Ghandi’s belief systems. They are admirable, and praiseworthy. But to these lengths? To the detriment of the lives of others? He failed to see the value of the middle way. Make a vow not simply to make a vow. Hold steadfast to resolution only when it is the right thing to do, not when it is the only thing you know how to do. As much as we admire the saints, it is actually more difficult to live in the world of gray than it is to practice in the realm of black and white. That is our Zen challenge: the middle way. If you haven’t already read Thomas Friedman’s Hot, Flat & Crowded: Why We Need a Green Revolution, put it on your list. I’m heading into the last chapter now – and it’s one of those books that makes me want to run out and buy a dozen copies, to distribute to all my friends. The title refers to three impending crises: hot (global warming), flat (the burgeoning middle class around the world, leading to greater use of resources and energy), and crowded (the population explosion). Friedman, a New York Times columnist, argues that the dovetailing of these three trends is pushing us into a new age, the Energy Climate Era, in which the world as we know it must either change – or we will all perish. Sounds dire, I know. And the first few chapters are a bit of a downer. The problems seem almost insurmountable. But what makes the book good is that here are not just problems, but also solutions. Friedman talks to experts all over the country, and the world, and shows us how we can change in time to evade disaster. One part that particularly struck me was the chapter called “205 Easy Ways to Save the Earth.” Friedman points out that “green” is so hip now, that every magazine, every group, is coming up with lists of ways to make a difference. But they’re always presented as “simple” or “easy” – it’s painless being green. Sure, all of those little things add up. Using CFLs instead of conventional light bulbs, recycling your aluminum cans, bringing cloth bags to the grocery store – that matters. But Friedman argues that this can hardly be seen as a revolution. It’s more like a fashion statement. Revolutions are about turning the world upside down, shaking things up from top to bottom, radically reconfiguring the way we look at everything. We’re talking casualties, bloodshed. I don’t mean that literally, that people will have to die. But institutions and ideas should definitely be on the chopping block. Friedman gives dozens of real-life examples of people and companies and even government agencies who are re-thinking every product made, every watt used, every structure built, and coming up with the innovation that is critical to save us from Mother Earth’s Judgment Day. The good news is that he remains convinced that the most effective ways to change our world originate with grass-roots movements. Nations and politicians need to be on board; but each one of us has the power to steer those governments (and mega-corporations) in the right direction. When my life feels out of control, I organize. I make lists; I double-check my Outlook calendar and make sure it’s in line with the calendar on the wall in the kitchen. I synch my Blackberry. I go through the stacks of unread magazines and put them in order of title and date. I sift through the basket of “mail to take care of” and toss the stuff that is now so long overdue that it is no longer relevant. I look at my bulletin board, and do the same thing – pull off all the items that happened months ago, so a reminder is no longer necessary. I pick up the books perched precariously at the edge of shelves, and file them in the appropriate section on my bookcases, alphabetical by author. I file paperwork from the DMV and other old bills in the color-coded, labeled folders in my file cabinet. When even that is not enough, I go to Office Depot and wander slowly through the office organization aisles. I end up coming home with a new cabinet, or a three-tiered letter holder, or magazine rack. Then I go home and tackle things fresh. Now is one of those times. My energy level has been so low that it would make a three-toed sloth look positively peppy. I have barely been able to drag myself out of bed to do the tasks that are absolutely required, like showing up for work, or keeping commitments to go to my precepts class or doctor’s appointments. I seem to be moving through a dense, impenetrable fog. Each step requires vast reserves of energy, and yet I have nothing in that reserve tank. Given that scenario, it makes perfect sense that today I would choose to use my unexpected two or so hours of relative vigor to do the one thing that makes me feel secure. I put things in order. I tried out every pen in the house that I could find and threw out all the ones that don’t work, or were so cheap that they’ll invariably fail right when you’re trying to write down an important phone number. I straightened every picture on the walls. I even moved several of them to new locations, because I saw that the balance wasn’t right. I carried things from the left side of my office to the right side of my office. I picked things up from one shelf, and transferred them to another. I went into my Outlook calendar, and changed the due date on everything that was supposed to be done last week, so it wouldn’t look like I was so far behind. In other words, I didn’t really do a damn thing. I wonder who I think I’m fooling, when I act busy this way? I’m in the privacy of my own home; no one else is watching. So what exactly am I trying to prove to myself? That maybe if the external appearance shifts, it is evidence of real change underneath? That I really am in control of my emotional state and my life, if my mail is properly filed in color-coded folders? So I should not have been surprised when I stumbled upon The Zen Path through Depression by Philip Martin. Since it seemed a natural fit for me, I bought a copy. The trouble is, when I’m not depressed, I find no reason to pick it up. And when I am depressed, I don’t have the concentration or the energy to read. There it has sat, on my bookshelf, for at least 10 years. But for some reason, tonight I glanced over in that direction and spotted it. I had enough inclination to at least pick it up and flip through the pages, even though the thought of sitting down to read the whole thing is a little daunting. Return to the place you have imagined as your depression. If you have been here a number of times, you know this place well. You may even feel comfortable here. You have found it is no longer a terrifying place, and that there can be much of value in this place. As you return, envision that in this place there is now a path to be found. Perhaps it is a trail that has been worn through the dark forest you were in, or a star to follow to guide yourself out of a deep desert night – or a lifeline you can follow from deep beneath the sea. Look closely at this path, this trail, until it becomes clear to you. Realize that there is a way out of this place you once thought you would be lost in forever. Are you ready to leave? Are you perhaps surprised to find you are sad at the prospect of leaving? Are you ready to begin the journey? So much resonates for me in these words. Yes, I know there is much value to be found in depression. I have lived deeper and more intensely because of these battles, and I believe they have made me more compassionate, more honest, and more courageous. I love the image of the star leading me out of “a deep desert night.” There have been many, many nights with no stars. But now, as I think on this, it is exactly like nature’s sky: on the night’s without stars, they are not actually absent; they are hidden from view. The stars do always come out again. And while I am waiting for the star to appear – it is a long night’s journey into day.